People for the Ethical Treatment of Animals’ has stricken Victoria’s Secret from its list of cruelty-free companies after the lingerie giant confirmed its decision to sell beauty products in mainland China. Although the Chinese government has, in recent years, relaxed its animal-test mandate for certain types of cosmetics that are produced and sold in the country, the new rules don’t cover imported or specialty products. American-based firms have been eager to capitalize on the Asian country’s $15-billion-and-growing cosmetics market, however, with several companies, most notably Avon, Mary Kay, and Esteé Lauder, reversing decades of “no animal testing” policies to do so. China tests cosmetics on as many as 300,000 rabbits, guinea pigs, mice, and other animals each year, according to Humane Society International. Animals typically have chemicals dripped in their eyes, spread on their skins, on pumped into their stomachs in lethal doses. In light of the many modern, non-animal techniques available today, animal-based tests are widely considered as inhumane as they are unreliable. 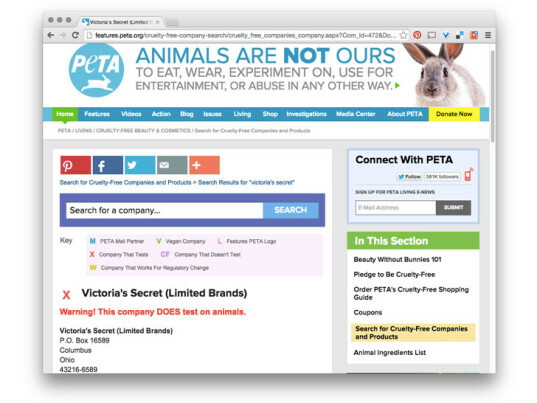 “Fortunately, PETA has received pledges from a number of companies—including The Body Shop, Urban Decay, Nyx Cosmetics, Yes To Inc., Jack Black, Paula’s Choice, 100% Pure, Jane Iredale, and others—that they will never sell in China while animal tests are required,” PETA said. We’ve also worked to convince companies selling in China to withdraw from that market until tests on animals are no longer required. These companies include John Paul Mitchell Systems, Dermalogica, Pangea Organics, Nature’s Gate, Juice Beauty, and LOGOCOS Naturkosmetik AG.